Student teaching here I come! I submitted my two week notice at work this week as it is finally time to student teach! I’m not sure which classes I’ll be teaching, but I’m excited! I had to take one final math class this summer, a differential equations class for teachers. It had been over 20 years since I had thought about the reverse product rule or integration by parts…I was struggling to keep up the whole class. Not to mention it was a full course packed into a 5 week session with classes that lasted almost 3 hours. I’ve been playing around with programming plugins in Minecraft using craftbukkit. 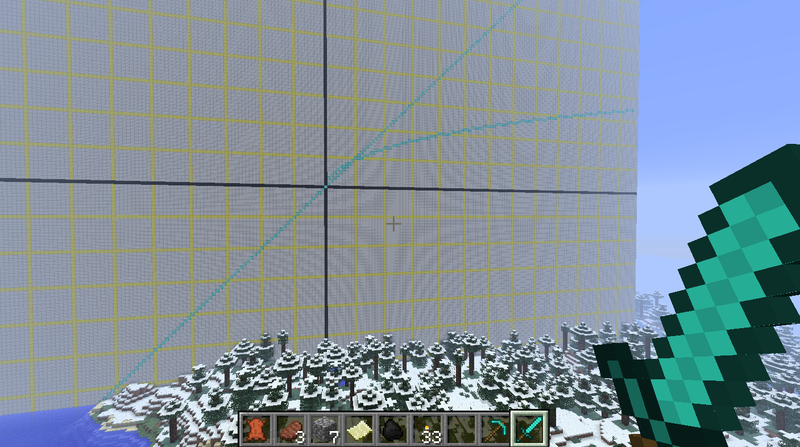 I hooked up an expression evaluator and I can now graph equations in Minecraft. I hope to figure out some cool way to use this in the classroom this fall. Suggestions are welcome. It has been months since I posted last…time for an update. 1. I had a successful Spring semester in my studies. Three A+’s! One was a very hard to earn in a 400 level Geometry course. One was not quite as hard to earn in an assessment class. The third was a gift by the “teacher”…and I use that term loosely. It made me feel dirty and cheapens what an A+ should mean. I’ll have to remember to not give away good grades when I’m a teacher. The students must earn them! 2. I was awarded a Noyce Mathematics Education Teaching Scholars scholarship worth $25,000. Woohoo! 3. I am taking summer classes now…so no break for me. 😦 The Fall is going to be busy, but I will actually get to be inside a high school for one of my classes. I can’t wait! I took my first two classes toward my teaching degree this semester…and I made an A in both classes! Those young whippersnappers ain’t got nothin’ on me. I found out that one of the students in my class was born the same year I was in college the first time. I was sitting in Honors Calculus while he was spitting up and dirtying his diaper. It feels weird being in class with adults (who seems like kids) who are half my age. But I’m learning a lot and having fun. If all goes as planned, I’ll be doing my student teaching in the Fall of 2014. I can’t wait! At first, being in a stupor after final exams this week, I thought I should get the equation into y=mx+b form so maybe it should be y = 2x – 12. But the graph on the page doesn’t go to -12 so I quickly realized my error. Of course, if you solve for x, it is x = 6 which is a vertical line. On the page, there is a video under the title “Stuck? Watch a video.” I started it and the first sentence was “…any linear equation can be written in the form y is equal to mx plus b”. Hmmm. No where in the video did it mention vertical lines. So, if some student happened to get -2x=-12 and got stuck, and then watched the video hoping to find out how to graph it, they would have spent 11 minutes without their question being answered. I just found another Khan video about graphing lines…9 more minutes and no mention of vertical lines. I’ve watched (ok…fast forwarded through) a few videos at Khan and I still can’t find one that talks about vertical lines. I’m sure one must be there somewhere. Notice that there is no y in this equation. Try solving for x and see what happens. This equation represents a line where all of the points have x=6. Let’s pick some points where x=6. (6,−5), (6,3) and (6,5) are all good choices. We can see that these points line up to form a vertical line that crosses the x-axis at (6,0). I can hear students now: Why is there no Y? What is the slope? I have questions! Also, for some reason, none of the equations are in the form y=mx+b…they add the additional burden of solving for y before I can begin the task of graphing them. I was able to do them in my head, but now some students will have to break out a pencil and paper (or click on the hints) to get it in the correct form. This is supposed to be practice of graphing the equations, but it actually includes extra algebra which is just tedious and not directly necessary to the task at hand. If I was a teenage algebra student, I would probably be bored and aggravated. So, while this section would be good for practice or assessment in some areas, it may not be the best for initial instruction. It is little frustrations like this that can annoy students (and teachers) and shows just how difficult good teaching can be…especially trying to teach using video. In my first few attempts at teaching a lesson plan with willing subjects, I have had grand hopes of having a nice, very interactive discussion with my students. But I find that my natural tendency is to lecture. At the first sign of trouble, I tend to jump in and explain without giving them enough time to think and answer. I’ve got to learn how to ask good questions and to give them time to answer. That is one goal I need to focus on. So he calls me yesterday (he couldn’t wait for me to get home) to tell me what happened in his math class. He said that a group of students were around his desk asking him how to do something. So instead of just telling them, he thought about what I’ve been saying and was actually asking them questions to get them thinking and leading them to the answer! He said that they needed to struggle a little bit to learn it for themselves. I wonder if I will be able to implement this in my classroom one day…training the students who get it the first time to help teach those who don’t. Which triangle is more equilateral? Mr. Honner’s question is this: Which triangle is *more* equilateral? A 10-10-11 triangle or a 10-11-11 triangle? A brilliant question! Doesn’t it make you want to experiment with geometric ideas? I love it. I thought about it for a moment and toyed with the idea that is had something to do with the cost. At this point, I simplified the problem to areas and not volumes. It took a moment for my son to envision a square a bit “smaller” than an octagon might have the same area. I asked if the areas are the same, how about the perimeters? I posited that the more sides, the less perimeter for the same amount of area. I then asked which shape would ‘contain’ the most area with the least perimeter. He thought about it for a while…at first said something about the sides would be infinite. I led him through the math of calculating the area of an octagon with a side of one, setting it equal to pi*r*r, and solving for r. I then asked him for the formula of the “perimeter” of a circle. He said, “you mean circumference?” Yes! We calculated that the circumference was 7.7 and the perimeter of the octagon was 8. I asked about a square and had him guess if it was more or less than the octagon. He guessed more and we calculated it…8.7. He said we should take our scratch paper to the Chili’s folks and tell them how they could save money on packaging material if all their containers were circular. I hope I have lots of moments like this when I’m teaching. Earlier this year I was looking for a new software engineering job. I had just gotten back from a Caribbean cruise and decided, strictly for fun, to search for software jobs in the Caribbean. I found a website that was for all jobs in that area (not just software jobs) so I started to look over the list. I happened upon a job listing for a teaching job. I remember thinking to myself, “what an awesome job…teaching kids and living in the islands.” Then it hit me–I really wanted to teach kids! I know that sounds corny…but that’s how it started. After this, I had the feeling that it was a “calling” and that I should pursue it. I am currently enrolled in a local university working part time on a Master of Arts in Teaching Mathematics while continuing my full time software job. I feel so lost at times. My first day of classes, I show up to class and the teacher says to log into a particular web application. I had never heard of it before and I felt like a fish out of water. So I’m looking over at other students trying to figure out how to get to the application. I finally manage, but it was a rough start. I had no orientation before my first class…I guess as a non-degree studies student I slipped through the cracks. I hope to be admitted to the Master’s program in the Spring. I am in one education course and one math course this semester. I think the last time I was in a math class in college was before a lot of the other students were born. Seriously. 20 years ago. My first project in my education class called for us to write a lesson plan. I had no clue what one was and felt like I was way behind the other students. But I did manage to squeak out a A for the project. So far, I’m having a complete blast. Classes are fun and challenging. I know I’m working toward something I really want to do. I really wish I could quit my job and go full time, but I’ve got to start saving up money for the time I’ll be student teaching. Of course, I’m not going into teaching for the money. I’ve actually calculated it and I’m probably giving up well over a million dollars over the rest of my career to switch to teaching. But what I gain is priceless. I am a Software Engineer working on a Master’s Degree in Teaching with plans to become a high school math teacher. This blog, if I keep posting (and that’s a big if) will be a place for me to talk about my journey and things I find along the way.